Completely rewritten, this edition has expanded coverage of zoonotic viruses and the diseases they cause, and viruses and viral diseases of laboratory animals, poultry, fish, and wildlife. The concept of new emerging and reemerging viral diseases reflects the new perspective this concept has brought to veterinary and zoonotic virology and related fields. Part I presents fundamental principles of virology related to animal infection and disease. Part II details the properties and clinical features of the viruses that afflict animals and describes their treatment and control. Veterinary undergraduate and graduate students, postgraduates studying animal viruses, virologists, microbiologists, and veterinarians interested in infectious diseases. 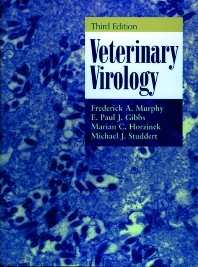 Principles of Virology: The Nature of Viruses as Etiologic Agents of Veterinary and Zoonotic Diseases. Viral Taxonomy and Nomenclature. Viral Replication. Viral Genetics and Evolution. Virus-Cell Interactions. Mechanisms of Infection and Spread of Viruses through the Body. Determinants of Viral Virulence and Host Resistance-Susceptibility. Immune Response to Viral Infections. Pathogenesis of Viral Diseases: Viral Strategies and Host Defense Mechanisms. Pathogenesis of Viral Diseases: Representative Model Diseases. Mechanisms of Viral Oncogenesis. Laboratory Diagnosis of Viral Diseases. Vaccination against Viral Diseases. Epidemiology of Viral Diseases. Surveillance, Prevention, Control, and Eradication of Viral Diseases. Hepadnaviridae, Deltavirus. Viral Diseases by Domestic Animal Species. Glossary. Index.